For accurate continuous on-line colour measurement. 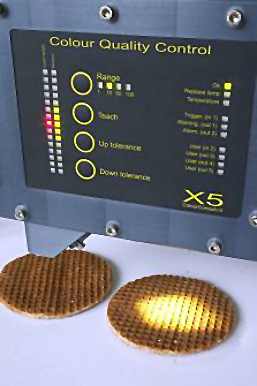 The X5 can be used in any industry where colour is important as a product enhancer or as a process control indicator. The X5 Colour Sensor is a stable and accurate industrial colour measuring system, intended for online colour quality control.It uses 3-stimulus technology. For full spectral data view our X9 in-line spectrophotometer. The X5 can measure continues processes or spaced objects by using a trigger input. The system can be used to measure liquids, at high or low temperatures, electro static environments, etc.. Places other colour sensors won’t last. Various digital in- and outputs and ethernet make it easy to connect the system to external hardware like a plc or pc. 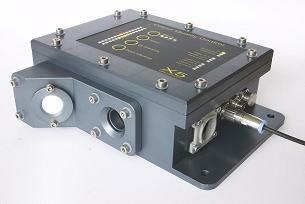 The sensors modular setup provides solutions for a wide range of applications. Optimisation of distance from substrate and area of measurement. Fibre optic modules for transmission measurement of transparent, semi transparent and liquid materials. The X5 can be controlled stand alone by the membrane keyboard on the sensor itself. Multiple sensors can be linked and controlled from one central PC by use of ethernet, allowing inspections at various positions in the process. The windows based software can be used in two ways. 1.To configure the colour sensor for stand alone use. 2.Leave the pc connected to visually monitor and log colour information.